Martin E. Marty is the Fairfax M. Cone Distinguished Service Professor, Emeritus, at the University of Chicago Divinity School, where he taught for 35 years and where the Martin Marty Center has since been founded to promote “public religion” endeavors. He writes the “M.E.M.O” column for the biweekly Christian Century, on whose staff he has served since 1956. 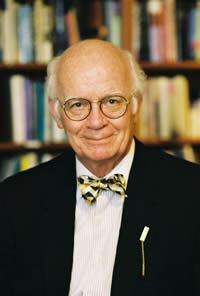 He is also the editor of the fortnightly Context, since 1969, and authors the Marty Center’s weekly. The author of over fifty books, Marty has written the three-volume Modern American Religion (University of Chicago Press). Other books are The One and the Many: America’s Search for the Common Good; Education, Religion and the Common Good and Politics, Religion and the Common Good, and with photographer Micah Marty, Places Along the Way; Our Hope for Years to Come; The Promise of Winter; and When True Simplicity is Gained. His Righteous Empire won the National Book Award.